The largest commercial flooring contractors in the North East. Contract Flooring and Interiors (CFI) was formerly part of a 150-year-old family business which demerged in 2005. Since then, we have grown to become the largest commercial flooring company in the region, giving clients the reassurance they are working with a financially and commercially strong contractor. We have a wide range of clients, including the NHS, councils, private building companies, public sector organisations, retailers and construction companies. After completing prestigious projects such as St Stephen's Shopping Centre in Hull, York University, Hull College and St James's Hospital in Leeds, we were promoted to 'Category One' supplier status for BAM Construction and we are currently the only commercial flooring contractor in the North East with this status – an accolade we are incredibly proud of. We worked on the Local Improvement Finance Trust (Lift) programme with the Sewell Group and are a preferred supplier, we also have the NHS maintenance contract for all the hospitals in Hull and the East Riding, and we hold the maintenance for the hull university. View our recent projects to find out more about some of the commercial flooring projects, office refurbishments and interiors we have undertaken. We place great emphasis on the skills and training of our team and our contracts managers have overall responsibility for the efficient progress of every project, keeping you informed at all times. Our quantity surveyors first assess, measure and estimate proposed work for your approval and we have our own CFI fitting team, all of whom are Construction Skills Certification Scheme (CSCS) registered and trained in health and safety. Fitters attend further courses on a regular basis to ensure they are updated on new products and techniques. Year on year, we increase the number of apprentices we take on and work closely with Construction Careers Ltd to recruit young people, training them in-house through one-to-one mentoring with experienced floor layers. In 2005, we achieved ISO9001 accreditation, awarded by the United Kingdom Accreditation Service (UKAS). We continually monitor our performance and actively seek to improve our business, ensuring clients continue to be impressed by our work and service provided. We regularly send out feedback forms to clients, which are then monitored and discussed at monthly management meetings. 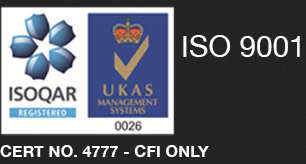 In 2011, we gained ISO14001 accreditation, ensuring we have a formal environmental management system in place. We had already been working with Polyfor on their Reconflor recycling scheme, where our waste vinyl was collected and sent to a recycling plant. We constantly strive to reduce our impact on the environment, using more environmentally-friendly options whenever possible.